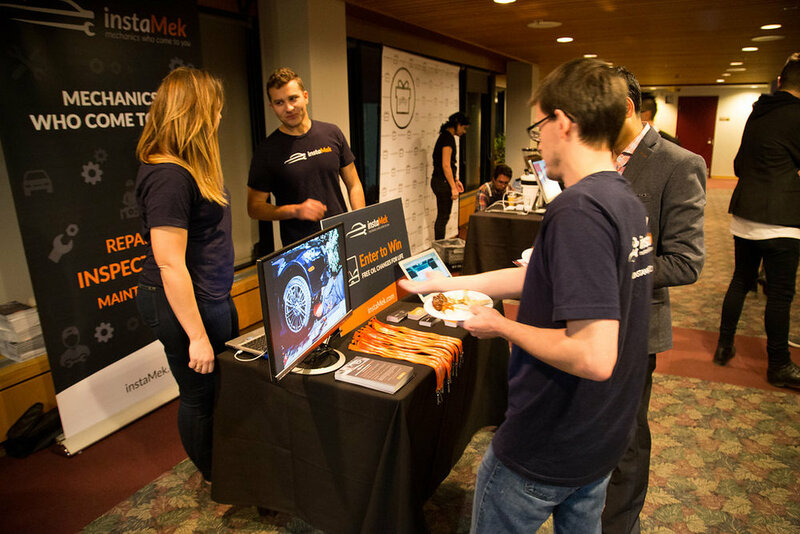 On November 17, 2016, 700 members of the startup community celebrated the accomplishments of Calgary tech entrepreneurs at the Red and White Club during Global Entrepreneurship Week. Of the attendees, 30% were founders, 11% worked at or with tech startups, and 6% were investors. The room was full of energy, excitement and people looking to connect. Just like the Calgary Stampeders practicing for the Western Final on the field behind them, the Top 10 Startups brought endless hustle to Demo Alley where they showcased their products and services. From Red Iron Labs’ virtual reality demo, to Debbie the pug from Spot Walk, there was never a dull moment. To satisfy your inner scientist, Interface Fluidics’ brought back memories of childhood science fairs with their mini laboratory, while MycoRemedy was blowing minds with fungi-based remediation techniques! If attendees were looking for a boost, Gifty, and their coffee partner Monogram, were preparing lattes for anyone who redeemed a Gifty (aka texting a coffee to a friend!) If you were looking to satisfy your taste buds, advertiise was giving out branded cookies and TasteTro was creating revolutionary spice blends. The buzz continued along Demo Alley all night. The “VC Rapid Round”, presented by Osler, featured venture capitalists from both Canada and the United States who discussed how early-stage startups can attract investment. The panel, moderated by Frank Turner, Partner at Osler, included Amy Rae, Principal at Vanedge Capital; Priya Saiprasad, Principal at Microsoft Ventures; and Minh Le, Market Manager at Silicon Valley Bank. The third annual Rod Charko Service Award, presented by Rod’s son, Bradley Charko, was awarded to Alice Reimer for her hard work creating an impact in Calgary’s entrepreneurial community. The A100’s Calgary-based members and Cynthia van Sundert, Executive Director of The A100, awarded ZayZoon with The A100 One to Watch Award. Out of the top 10, ZayZoon displayed characteristics of a company that is most likely to succeed. Launch Party attendees used the mobile app developed by Uppercut to select the winner of the People’s Choice Award, Paper. Kristina Williams, President and CEO of Alberta Enterprise, announced the launch of Accelerate Fund II, providing $10 million for Alberta startups with Brad Johns of Yaletown Venture Partners and David Edmonds of The A100, as Fund Managers. Thank you to all of Launch Party sponsors, community partners, volunteers and supporters for making the evening such a success! Can’t wait to see you all again next year!